The Southwest Mind-Body and Integrative Medicine Conference takes place every year in October. 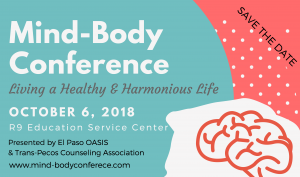 The mission of the conference is to promote a culture of health and wellness in the El Paso, Juarez, New Mexico region by providing training and education in holistic health and healing methods and modalities. The event is open to the public higher awareness of holistic and preventive self-care in the community. The event also serves the professional community by providing CEU’s approved by the state of Texas to Counselors and Social Workers. Main sponsorship includes use of logo on marketing and promotional material. Sponsor will be mentioned throughout the promotion and event opening and closing. Also included is one display table and two tickets for event. Event sponsors will be featured throughout the event. Sponsor logos and information will be included in conference package. Sponsors will be mentioned at the start of one of the individual sessions. Individual or business interested in donating $100 to the event for student membership & scholarships. Donation will go to offset cost of new student memberships and provide scholarships to future members. 10 tables will be made available to local business interested in promoting their organization, services or products. Businesses are selected on a first come first serve basis. Conference does not guarantee exclusivity.